Winnie graduated from Ambassador Pamela Mboya Girls High School in the fall of 2017. She is now studying at Kenyatta University to obtain a diploma in Special Needs Education. 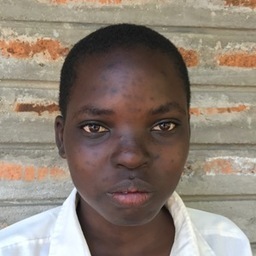 Winnie Okeyo was born on the 8th of December 1998. She began attending CGA in 2003. Winnie graduated from Ambassador Pamela Mboya Girls High School in the fall of 2017. She is now studying at Kenyatta University to obtain a diploma in Special Needs Education. Winnie's father works at a Christian Mission called SEEK (which is an old YWAM base). Her mother is a cook at CGA. Winnie is the second born of five children. In Winnie's homeplace, the family lives in a rented, two bedroom concrete house about two miles away from school. They have no electricity or running water and use lake water for washing and boiled it for drinking. Favorite person in Bible: is David because he was a God-fearing person. If I could be an animal I’d be: a donkey because they are always humble. One wild thing I’d like to do in life: is ride a horse.